Preston is one of my favorite science-based thriller writers. When I saw this book I snatched it up not realizing it’s non-fiction. It made no difference. 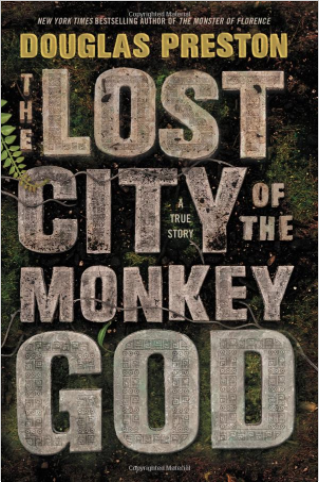 The book-based on his adventures in Honduras-is every bit as fascinating as one of his thrillers. There have long been rumors about a lost city in the Honduran interior. In 2012, Preston joined a team of scientists on a quest to find it. Going off findings from lidar (an amazing new mapping technology), Preston ventured into the densest kind of rainforest; terrain which hasn’t seen human habitation in hundreds of years. Battling impenetrable foliage, torrential rains, disease-carrying insects and deadly snakes, the group makes one of the greatest discoveries of the 21st century. Preston covers every inch of the battle from challenges posed by an ever-changing Honduran government to unchecked drug lords to environmental hostility. Intriguing glimpses are granted into a culture which predated the arrival of the Spanish conquistadors but vanished shortly after. Why? Preston’s answer presents a chilling reality for societies which all coalesce, peak and ultimately disappear. I didn’t know this was non-fiction. That makes it sound even more fascinating. I felt kind of foolish when I got it home because I just assumed it was another thriller. But I’m not opposed to good non-fiction if it’s done well. It was a really interesting read, but then I love all his stuff! Excellent review! I’ve heard this is a good one of his. I just read his first book, Dinosaurs in the Attic, about the American Museum of Natural History and how much of the collection came to be there. It was so fascinating and compellingly written, made me want to read more of his and this one sounds great! I loved it but I love all his stuff, fiction and non-fiction. I haven’t read Dinosaurs in the Attic so thanks for the recommend. I’m going to get it next. Glad I could recommend one, looking forward to reading your thoughts on it!